A two-fisted action game from the people who brought you the smash hit movie. The chase is on...all the way to the greatest treasure in history, the Holy Grail. And if you can survive the treacherous caves of Colorado...the medieval catacombs of Venice...the deadly ramparts of Schloss Brunwald...and the cunning traps of the Grail Temple...then you've earned your whip and your hat! Whip those bad guys...as only Indy can! Relive the greatest action scenes from the greatest Indy movie of them all. It's red hot, slam-bam action, Indiana Jones and LucasFilm style! 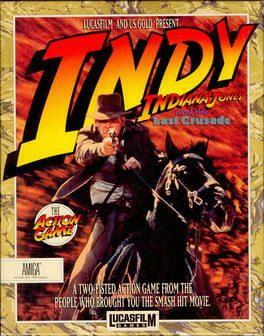 We currently don't have any prices for Indiana Jones and the Last Crusade: The Action Game. Check back later.